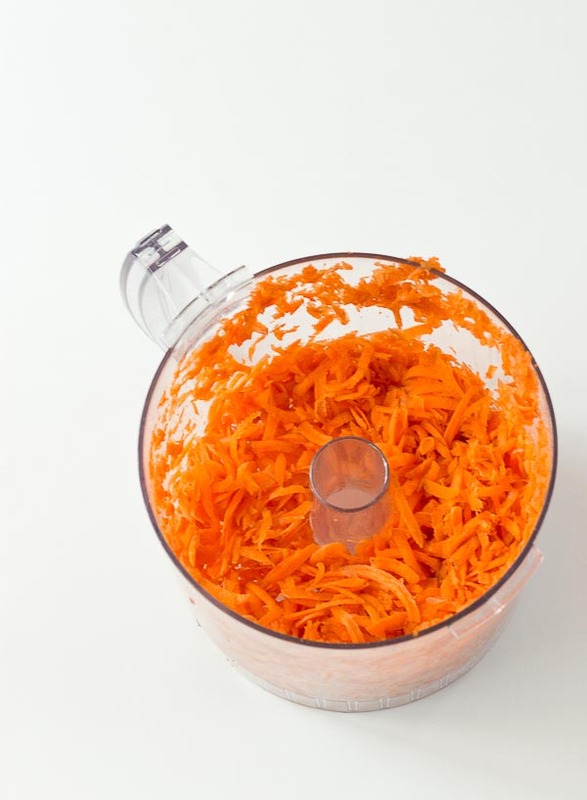 This Carrot Cake Pancakes recipe is sponsored by the National Frozen & Refrigerated Foods Association (NFRA). 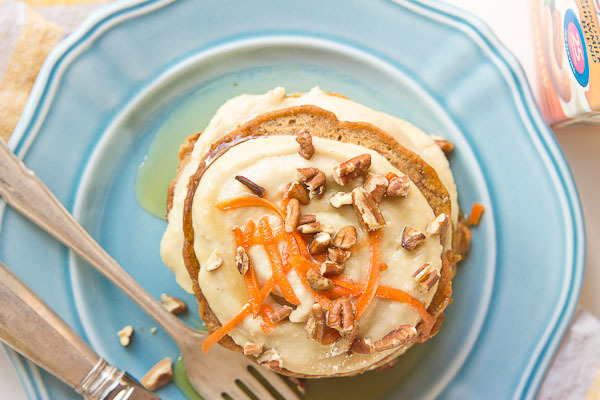 These Carrot Cake Pancakes with Cashew Cream Frosting are ahhhmazing. They are soft, nutty, and the cashew cream frosting is so so creamy! Who doesn’t love dessert for breakfast?? Let’s talk about what breakfast looks like in heaven. If there is breakfast in heaven, which I mean let’s pray there is… this is pretty much going to be it. 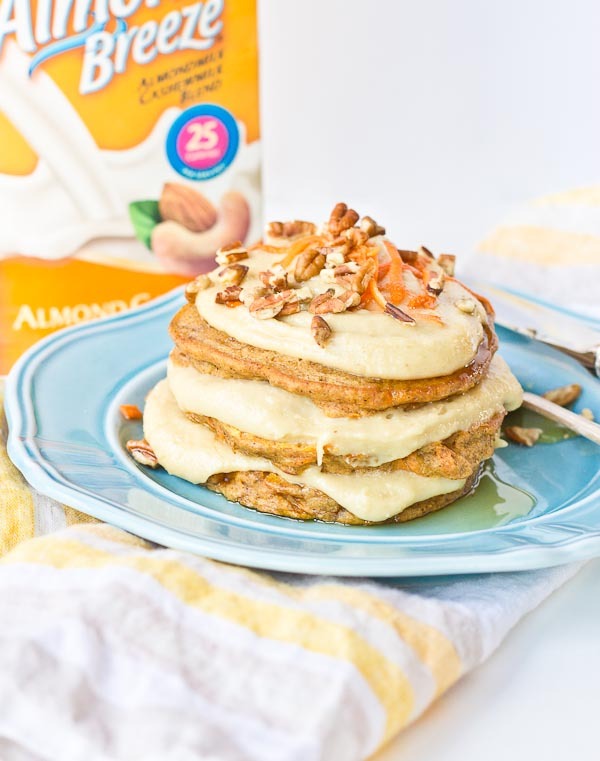 A glorious stack of Carrot Cake Pancakes layered with creamy Cashew Cream Frosting. Ohhhh me ohhhh my. 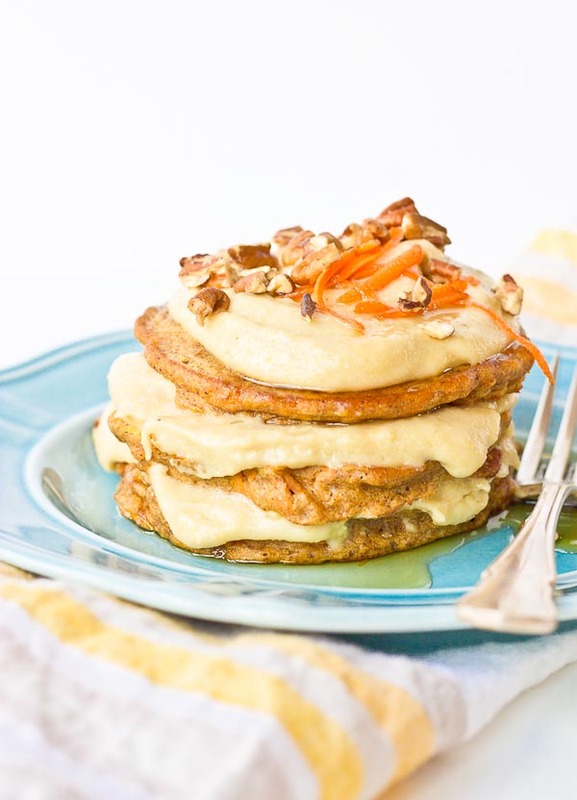 I’ve lost it over these Carrot Cake Pancakes because I mean it’s dessert AND it’s a healthy dessert AND there’s veggies for breakfast. You know, that’s like bonus points right there. Starting out the day with veg is like the triple crown. Who knew you could make dairy-free cream frosting with cashews!? This is the best invention ever! Cashews make this cream frosting thick and creamy, and oh so good. Like you want to lick the last bit out of the bowl good. Just blend cashews and cashewmilk with coconut oil, honey and vanilla and you get cream frosting that is oh so luscious. 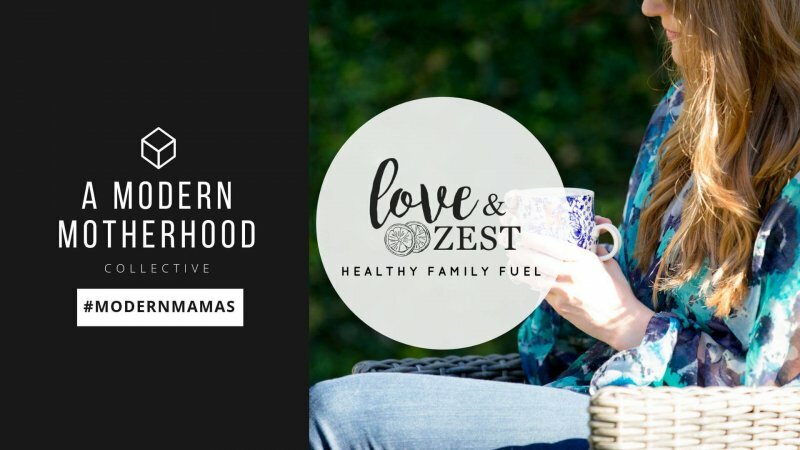 I used Almond Breeze Unsweetened Cashewmilk Blend because it combines almonds with the creaminess of cashews. You would NEVER know it’s lactose-free and vegan and made out of cashews! Cashews have magic super powers AND are a magic nut for sure. These pancakes speak to my dessert loving heart of hearts. 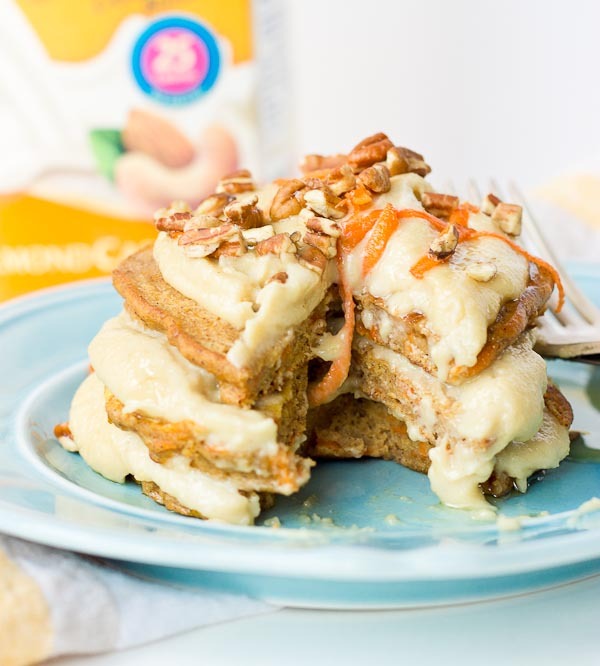 I hope you go and make a batch of these Carrot Cake Pancakes this weekend and serve them up with a thick layer of Cashew Cream Frosting for yourself and your kids/husband/friend/significant other, if you’re the sharing type. In June we celebrate National Dairy and Dairy Alternatives Month. As more people turn to plant based diets, dairy alternates are a great way to fulfill the bodies need for calcium, an important mineral vital for bone, nerve and muscle health! Hope you’re dad likes the pancakes! They are moist and delightful, and yes decadent 🙂 Enjoy! 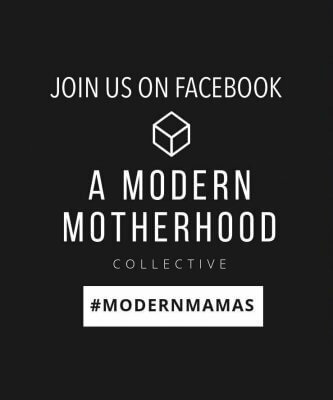 For more recipes and meal ideas visit Easy Home Meals on Facebook, Twitter and Pinterest. 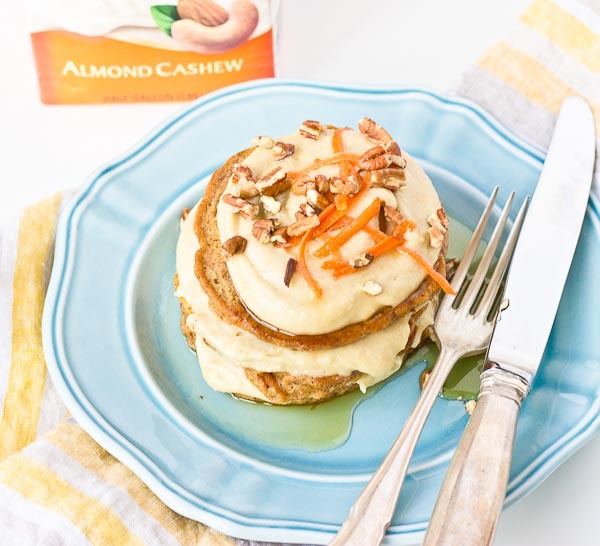 These Carrot Cake Pancakes with Cashew Cream Frosting are ahhhmazing. They are soft and nutty and the cashew cream frosting is so so creamy! Who doesn’t love dessert for breakfast?? 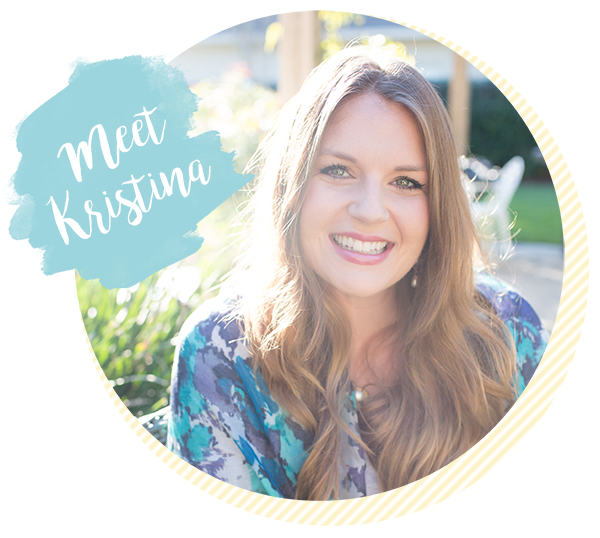 In a large mixing bowl, whisk together flour, baking soda, salt, cinnamon, nutmeg, clove, and ginger. In a separate bowl, whisk together egg, cashewmilk, honey, coconut oil, and vanilla extract. Heat griddle over medium high heat and lightly coat the pan with coconut oil (or butter if not dairy free). Ladle ¼ cup batter into griddle and cook until pancake bubbles on one side before flipping. Continue cooking until golden browned on both sides. Combine cashews, cashewmilk, coconut oil, vanilla extract, honey and salt in food processor or high powered blender, and blend until smooth. Top pancakes with cashew cream cheese and chopped walnuts if desired. Note: To freeze leftover pancakes, line baking sheet with parchment paper and arrange pancakes on sheet individually and place in freezer until slightly frozen before transferring to freezer safe baggie. Holy yumminess, these pancakes are needed in my household, like NOW! And even with frosting on top? Talk about dessert tasting like breakfast!